HNK Hajduk Split (Hrvatski Nogometni Klub Hajduk Split) or Hajduk Split as most people call them are a Croatian football team based in Split and founded in 1911. Their home ground is a 35,000 seater stadium called Stadion Poljud and their traditional home colours are white shirts with blue shorts and socks. The club’s “golden era” came in the 1970s when they won four Yugoslav leagues and five Yugoslav cups. Hajduk are also the only club in Yugoslav football history that managed to win five consecutive Yugoslav Cups and they remain the only team to have gone a season unbeaten. Hajduk have appeared in three European Cup (now the Champions League) quarter-finals as wells as on UEFA Cup (Europa League) semi-final. The Croatian club boast several well-known former players as discussed below. Notable former players for the Croatian side include former Besiktas and West Ham manager Slaven Bilic and veteran goalkeeper Stipe Pletikosa, who was nicknamed Octopus by the fans due to his excellent reflexes. Pletikosa was named Croatian player of the year in 2002 and he retired from international football following the 2014 World Cup. Lastly, we have Everton youngster Nikola Vlašić. The reason he is included is because he joined Everton for a fee of around £10m, which is a club record for the highest fee Hajduk Split have ever received! This post is written by @Casual_FM_, you can find him over on Twitter. Enjoy his club guide on Hajduk Split! Croatian midfielder Josip Radosevic is the highest paid player in your squad on £9k a week but he is certainly worth it. The former Napoli man has some impressive stats including 13 marking and tackling with the addition of 17 natural fitness. He will be your midfield general for years to come. Márkó Futács is my other pick for a top player at the club, the target man is one of the better players in your squad and the 27-year-old Hungarian will definitely have a big part to play for you in the first season at least. One thing is for certain, if you get the correct service to this man he will score you lots and lots of goals, shown by the 18 he scored in 26 appearances last season. The main area that I would look to improve within this squad is in the fullback area. As you can see from the screenshot below there is a lack of depth in quality in both the right-back and left-back position. There are currently only two decent options at the club in the form of André Fomitschow and Hysen Memolla on the left side, but to be honest that is all they are: decent options. If you were to bring in a new left back it would certainly help out with not only the defensive but also the attacking play in this Hajduk Split side. You’ll also need to bring in a more than decent right-back. Our first hot prospect in the Hajduk Split ranks is Fran Tudor. He should be used as your first choice in the right midfield area but he can play in all positions down your right (perhaps he can grow into the right back position). The Croatian currently has 3 caps for his country scoring 1 goal and at just 21 years of age I would say that this is quite an achievement. Our second hot prospect is a central midfielder who goes by the name of Toma Basic, to me he looks like he has the potential to become an integral part of your squad. The 20-year-old played 28 games for Split in the 2016/17 season and will be hoping to impress you this season. First team football will certainly be crucial to his development. 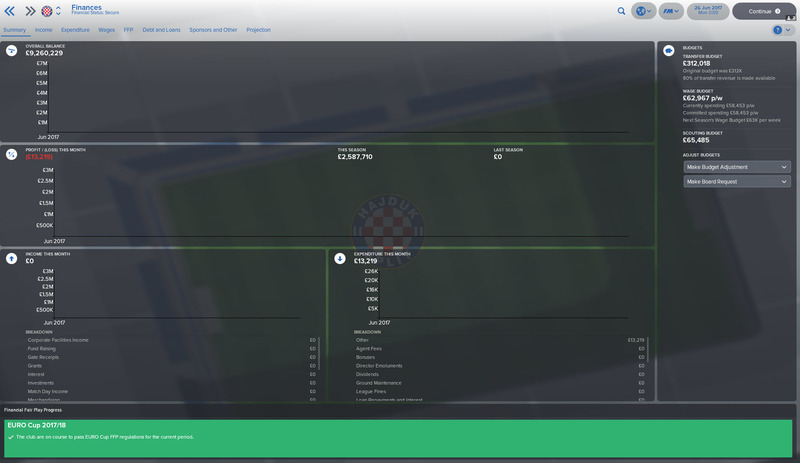 Hajduk Split have okay finances with around £65k on the wage budget but they only have around £300k in the transfer budget. A way to build up a bank balance could be to look for youngsters abroad with potential. You could bring them in for cheap and sell them on in a couple of seasons for profit. In the short term, I’d look for some loan signings to add some depth to your current squad. 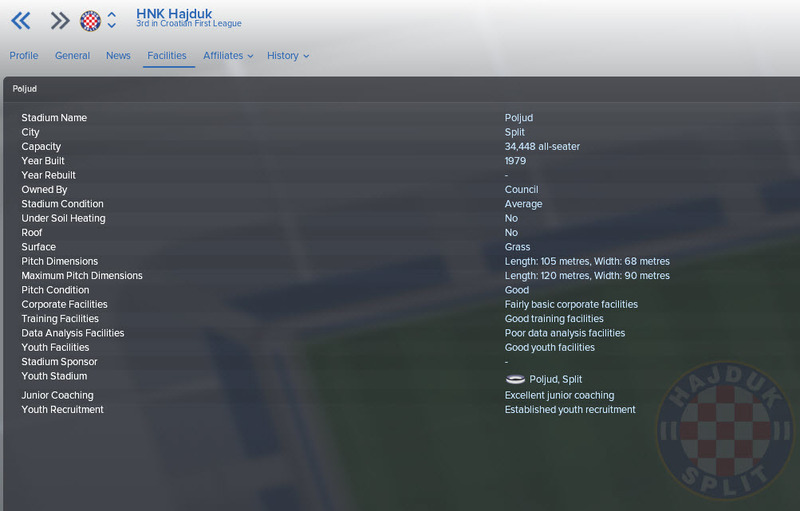 So good luck to everyone who manages HNK Hajduk Split and I hope you have a fun time over in Croatia, please let me know how you get on in your saves either in the comments by heading over to my Twitter @Casual_FM_. Thank you for taking the time to read this club guide! 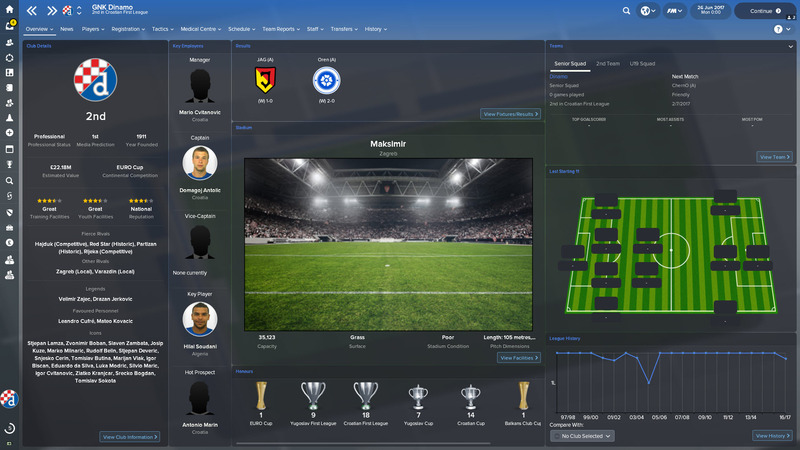 This entry was posted in FM Guides | Club Guides, FM18 Guides, Experiments & Wonderkids, Football Manager 2018 and tagged croatia, FM Guides, fm18, football manager, hajduk split. Bookmark the permalink.